The original club were formed as a football offshoot of a gymnastics club Wiesbadener Turngesellschaft in 1899. 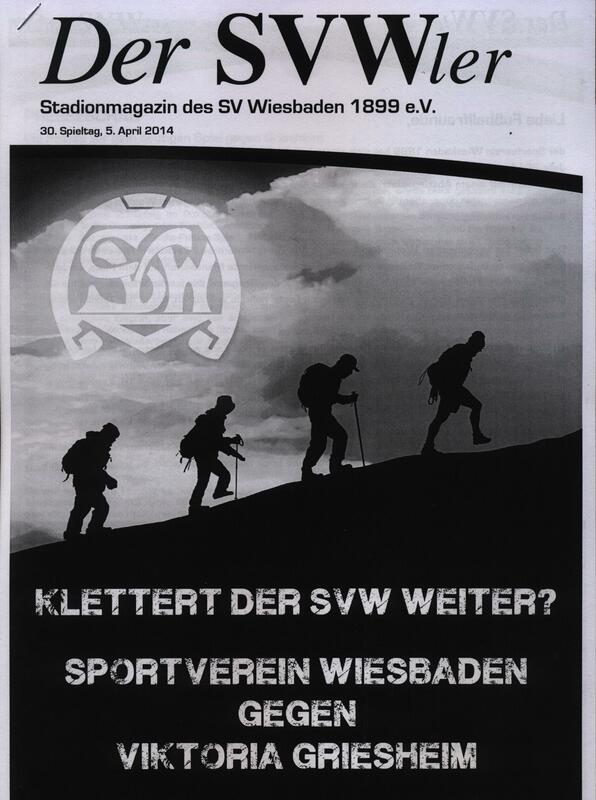 Five years later the football section broke away forming Sportverein Wiesbaden 1899. 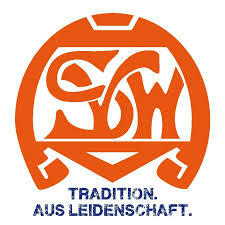 Prior to World War II the club were only sporadically successful and when the Nazis reorganised football in Germany in 1933, SV Wiesbaden were placed in the new Gauliga Südwest/Mainhessen but could not compete and were relegated in their first season in the competition. 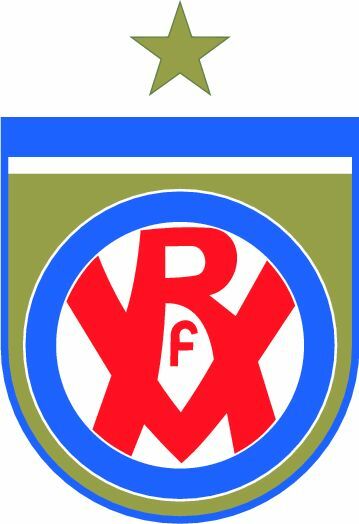 After two runners up places in the Deutsche Amateurmeisterschaft in the mid 1960’s, the club began to struggle and were relegated to the Amateurliga Hessen. In 1970 bankruptcy saw the club fall even further to the Landesliga Südhessen. 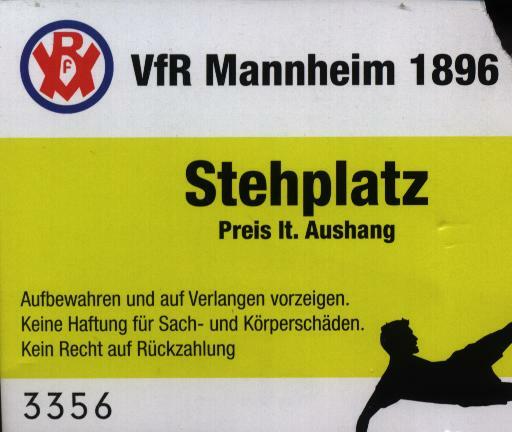 The 1980’s and early 1990’s the club enjoyed better times, investment bought dividends as the club consolidated in the Amateur Oberliga. However, the investment was withdrawn and in 1994 the club had no option but to close down and reform at the lowest level. 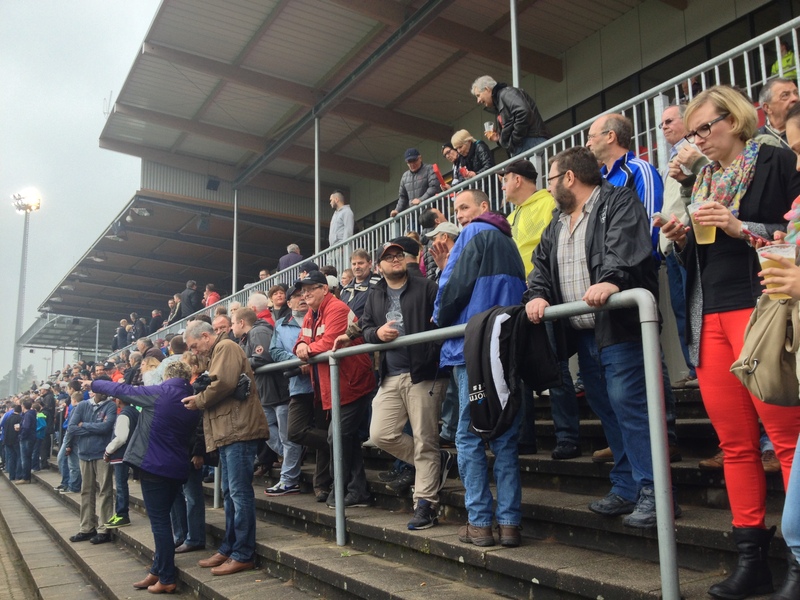 To their immense credit the reformed club have worked their way back up through the Landesliga and Verbandesliga and winning the latter in 2013 saw the club back in the fifth tier, Hessenliga. 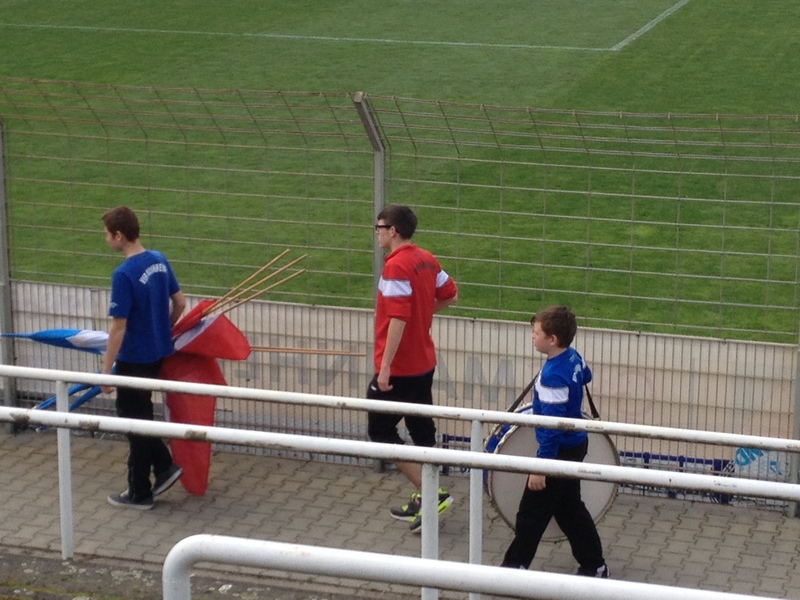 Despite the steady climb up the rankings, the modern era though has been somewhat sullied by the actions of a club called SV Wehen Taunusstein. In 2007 the club literally moved lock, stock and barrel from Taunusstein right next door to the ancient home of SV. 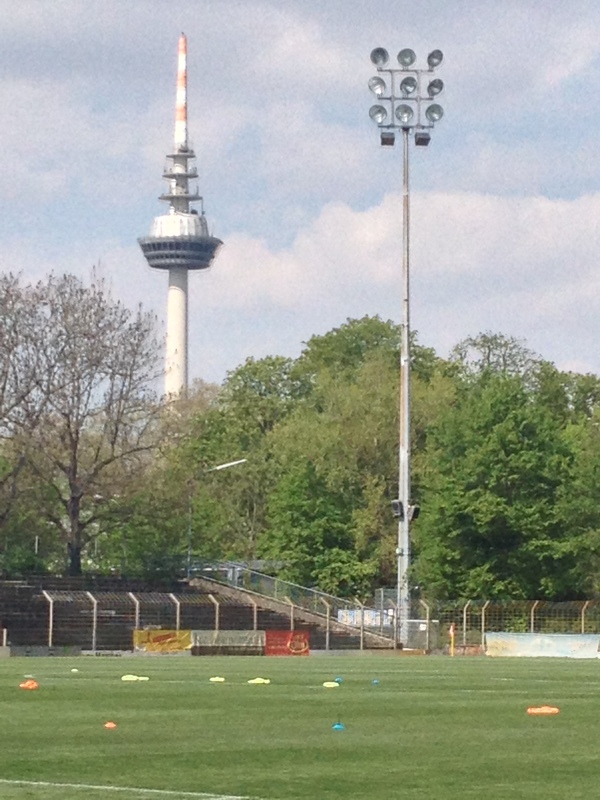 Unable to build a stadium to suit their burgeoning needs in their home town of Taunusstein, the club applied to Wiesbaden City council who gave them permission to build a new arena, the Brita Arena, in the city. 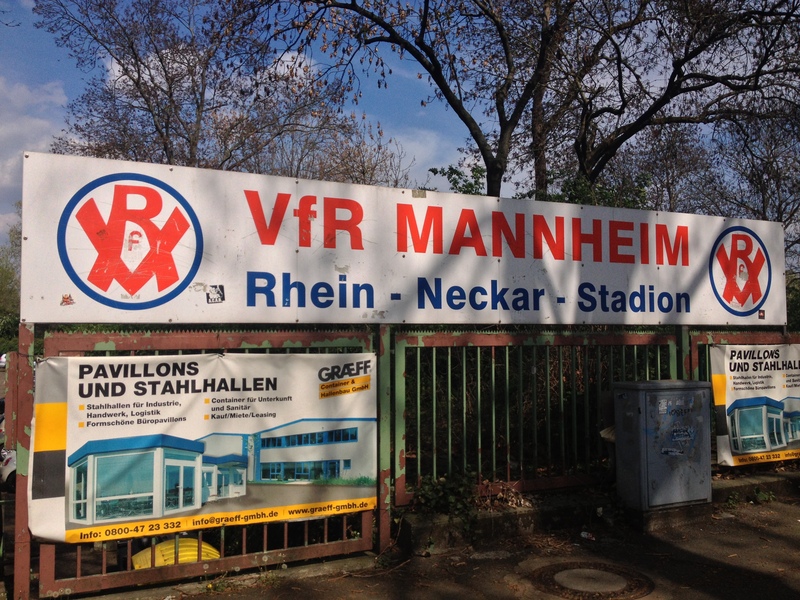 The relocated club rose as high as 2.Bundesliga and despite relegation to 3.Liga the club has tempted much support and advertising away from the city’s traditional club SV. 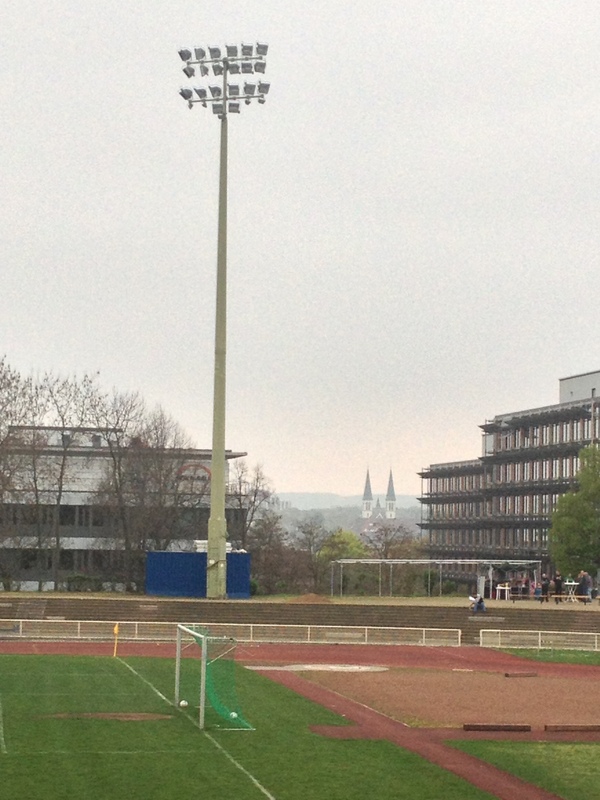 Much to the chagrin of SV 1899, the interlopers have added Wiesbaden to their name since 2007. In addition the fact that Wehen now market themselves with the strap line “Our city, our club, our team” must be a particularly bitter pill for the old club to swallow. A forthcoming Kreispokal cup match with their less than welcome neighbours at the Helmut-Schön is sure to be an interesting encounter. 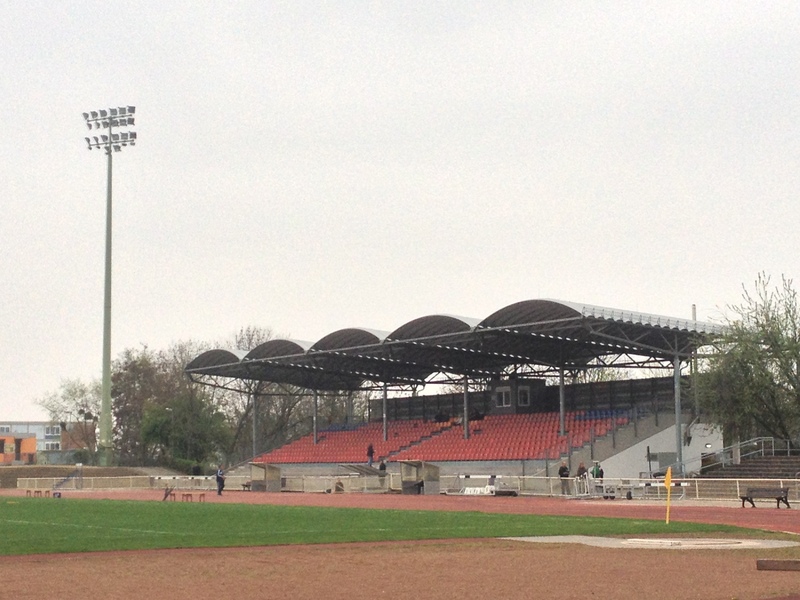 SV Wiesbaden play at an athletics stadium adjacent to the Brita Arena with an impressive capacity of 11,500. 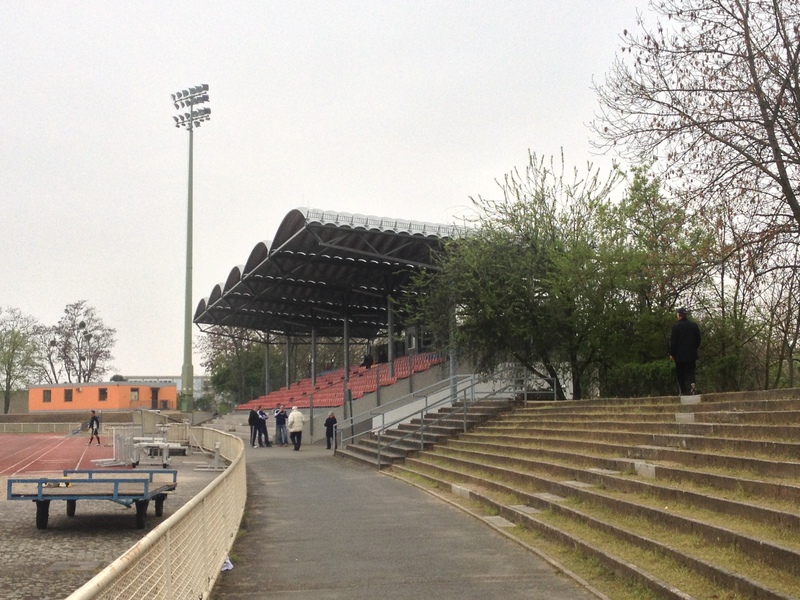 Now over 100 years old the Stadion an der Berliner Straße was originally opened in 1907. SV have played there since its’ inauguration. The stadium underwent some renovation work in 2008 when the roof of the grandstand was replaced with and eye-catching wavy pediment. 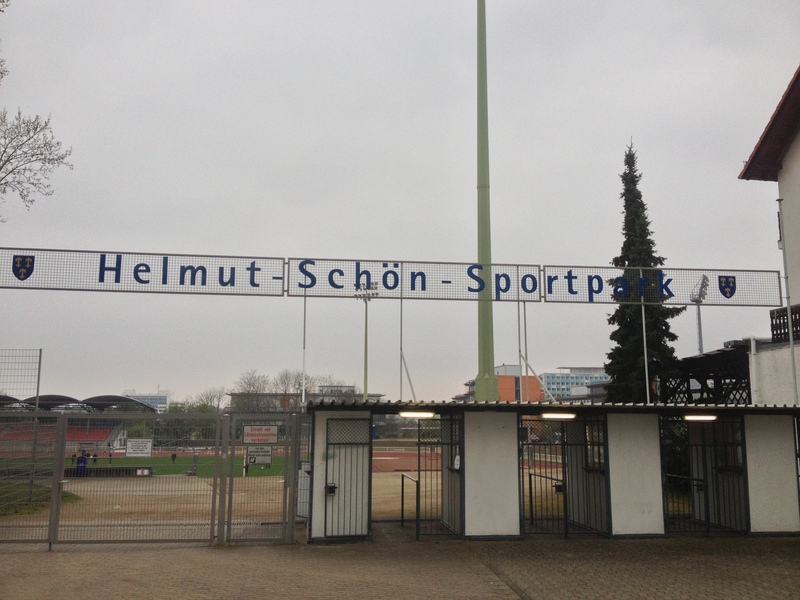 In 2009 the stadium was renamed the Helmut-Schön Sportpark in honour of the man who guided West Germany to World Cup success in 1974. Schön started his coaching career in Wiesbaden in 1951 and died there in 1996 aged 80. A legendary figure in the German game he won 16 German caps (scoring 17 goals!) before managing the national team for 14 years between 1964 and 1978. 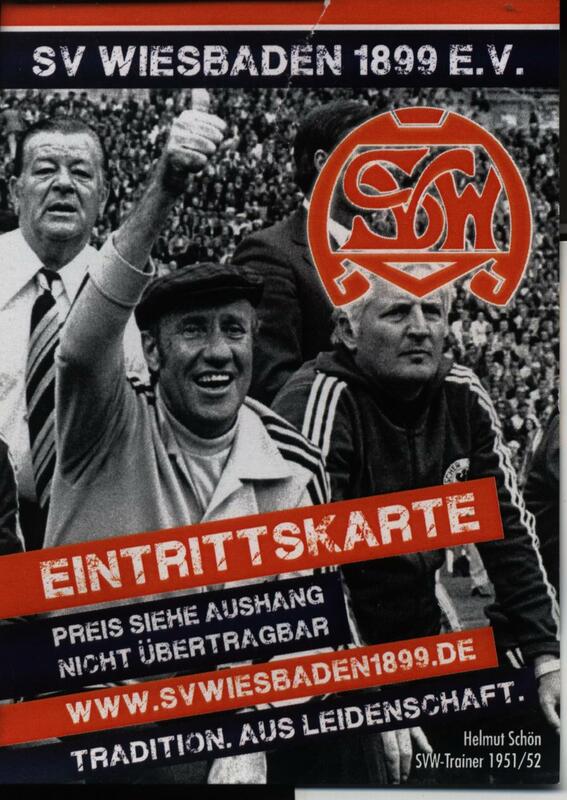 His image adorns the match ticket issued for home games. 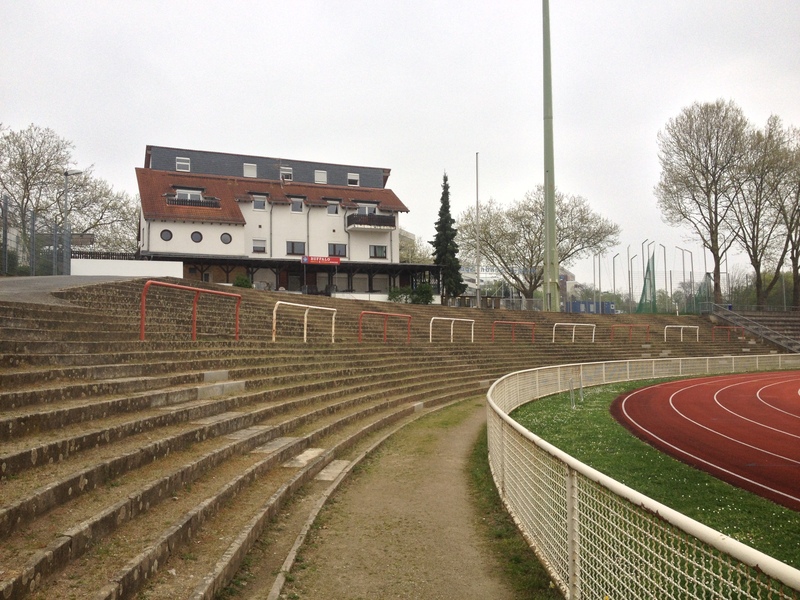 The stadium has also hosted American football since 1984, the club being second tier side Wiesbaden Phantoms. 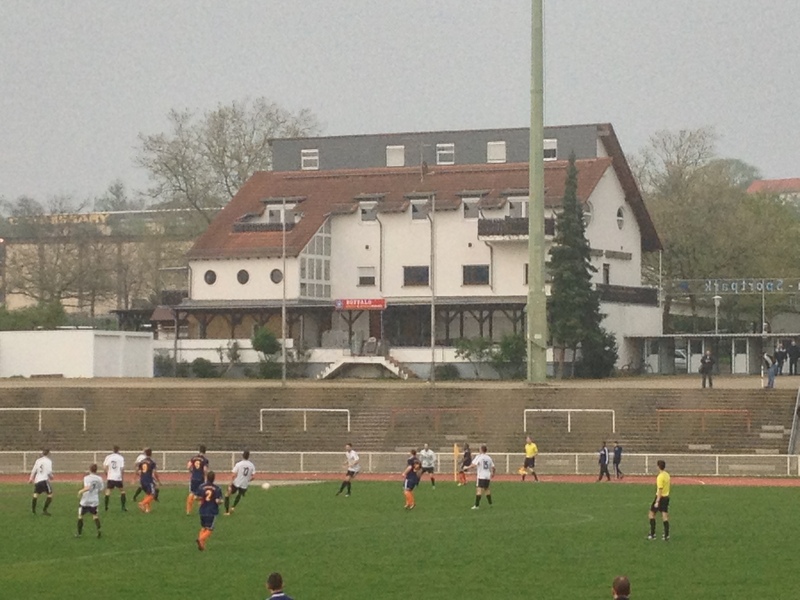 Both SV Wiesbaden and guests SC Viktoria Griesheim are struggling in the lower reaches of the Hessenliga and it shows in a game where real chances are few and far between. The visitors score the only goal of the game with a real piece of quality finishing from Starck. His celebration saw him kick the corner flag out of its hole and instead of the referee booking him he had to rather sheepishly go and restore it to its original position. The hosts chances of taking anything from the game effectively disappeared when Pajić was sent off for an overly robust challenge. Down to ten men SV did throw the kitchen sink at the visitor’s goal but just couldn’t find a goal. A competitive game and a club with a interesting ancient and modern history, this welcoming club is more than worthy of greater patronage than it currently gets. 30. Volkan Tekin, 2. Nico Haupt, 4. Marko Kopilas, 6. Christopher Hübner ©, 7. Philipp Reichardt, 9. Younes Bahssou, 12. Jonas Grueter, 16. Joseph Olumide, 21. Christian Demirtas, 22. Sascha Amstätter, 24. Strahinja Pajić. Subs: 1. Pero Miletić, 5. Milosz Adam Freund, 11. Sebastian Gurik (for 7,61 mins), 14. Elmir Muhić, 17. David Schug (for 22,61 mins), 19. Ivan Rebić (for 2,83 mins), 26. Mirko Dimter. 22. Stefan Scholz, 4. Fabian Windeck, 5. Joerg Finger, 6. Fabian Walter, 7. Yannik Brehm, 8. Kevin Jung, 9. Lukas Goerlich, 10. Jean-Marie Starck, 13. Dominique Jourdan, 15. Martin Schwarz, 21. Fabian Hinterschied. Subs: 24. Robin Schwarz, 2. Kevin Miller, 3. Efkan Erdem (for 13,68 mins), 11. Kamil Kwiaton (for 9,58 mins), 20. Mark Dillmann (for 8,88 mins). 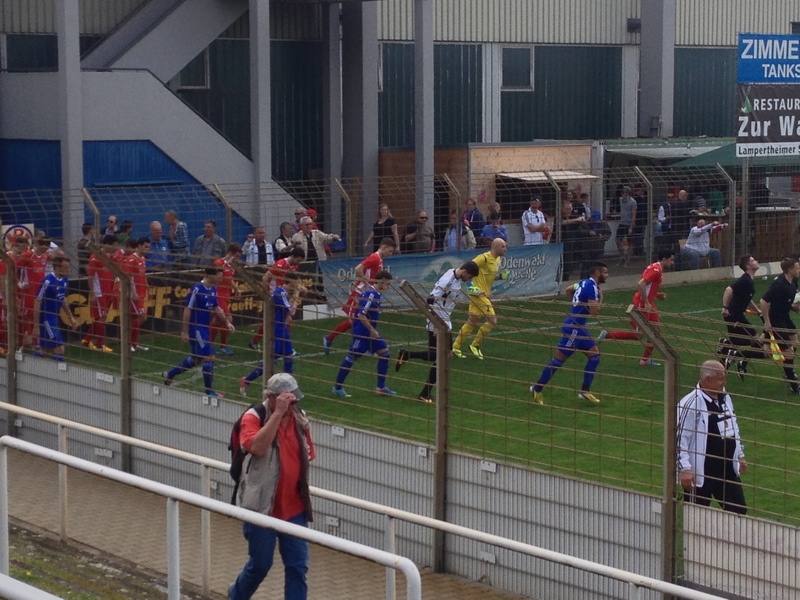 Yellow Cards: Reichardt, Grueter (Wiesbaden), Windeck, M.Schwarz (Griesheim). 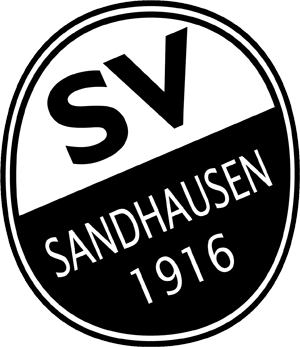 SV Sandhausen 1916 are based in the area of Baden-Württemberg just south of Heidelburg. From a modest formation in 1916 the club have really come to the fore since the turn of the 21st century. Rapid promotions saw Sandhausen playing at their highest ever level when, in 2005, the ambitious owner of TSG 1899 Hoffenheim, Dietmar Hopp, a software entrepreneur, opened negotiations with Sandhausen and near neighbours FC Astoria Walldorf. 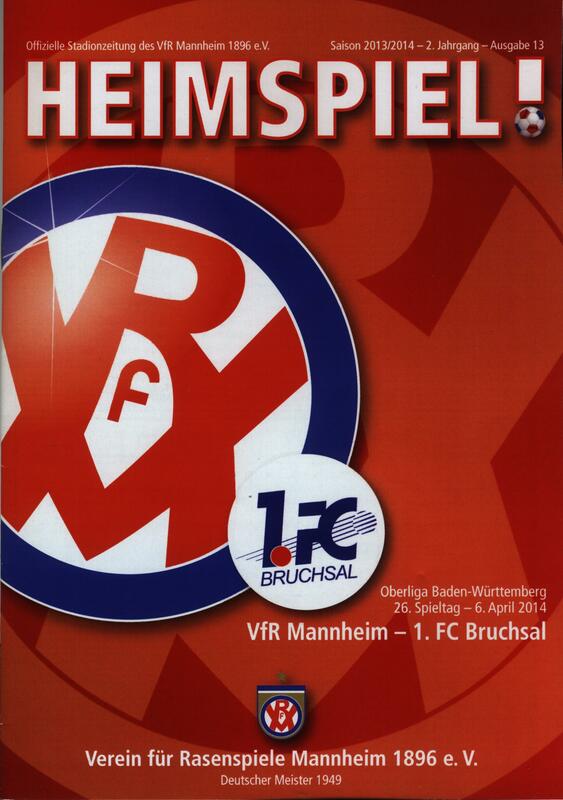 The aim of the negotiations was to form a Heidelberg based super club with an aim of Bundesliga 1 status. 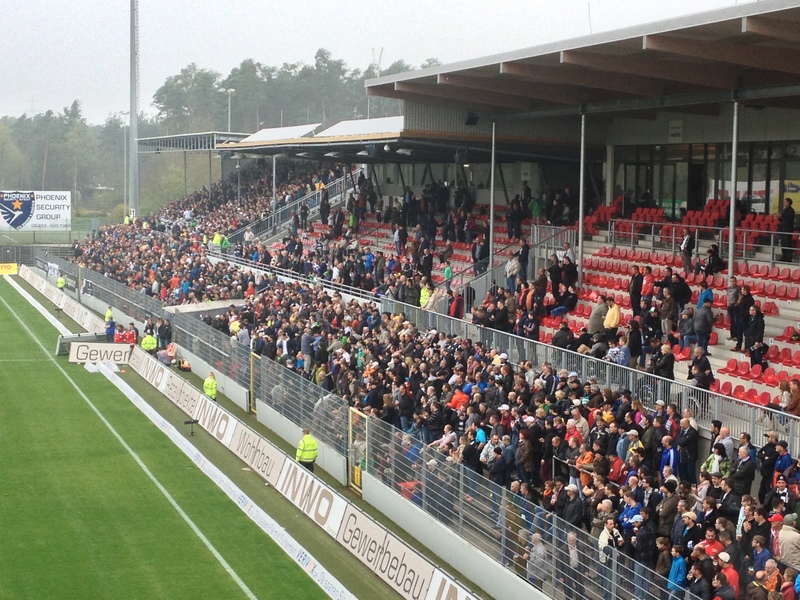 A name had even been proposed, FC Heidelberg 06, but after fierce resistance from the supporters of Sandhausen and Astoria the plans were shelved. Hoffenheim would go onto claim their place in Bundesliga 1, bankrolled by Hopp whose generosity extended to the funding of a new stadium. 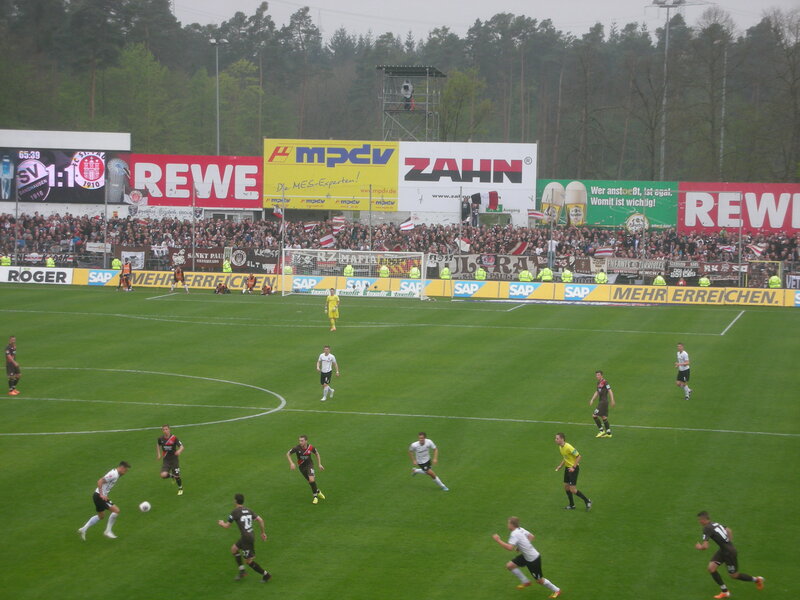 Sandhausen regrouped and barely had the dust settled on their continued independence when the DFB announced the formation of Bundesliga 3 for the 2008/9 season. Independence had always been a source of pride for the club, apart from a brief wartime merger with TSV Walldorf and VfB Wiesloch to for the short lived KSG Walldorf-Wiesloch. 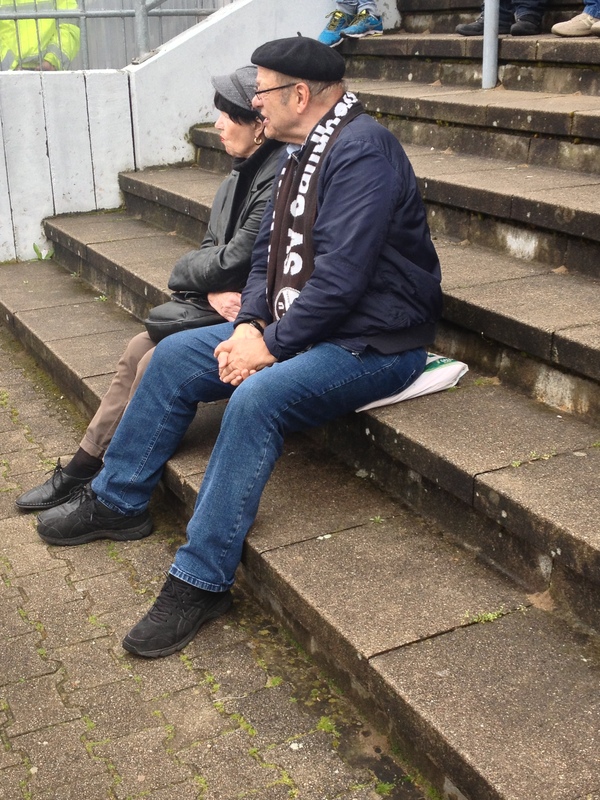 By 1945 Sandhausen had demerged and by 1951 had returned to its original moniker. 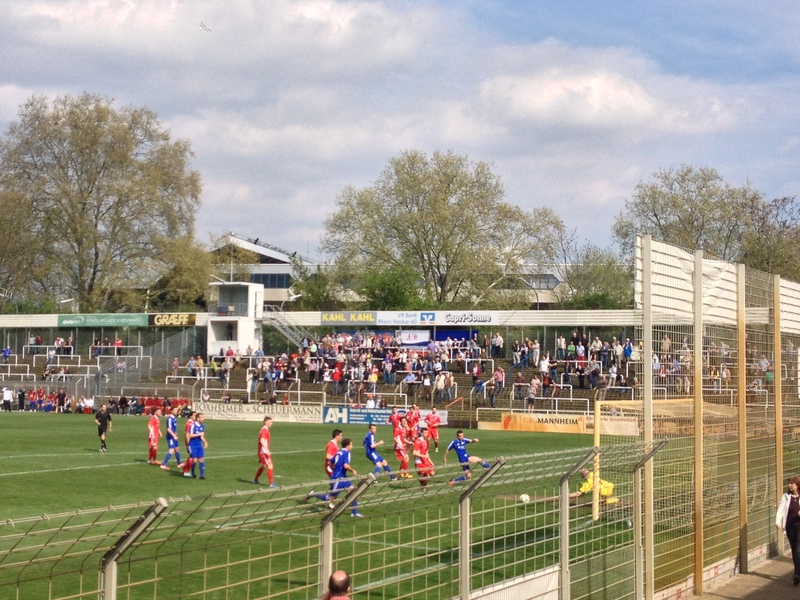 In the 1980’s and 1990’s the club dominated the Oberliga Baden-Württemberg, being crowned champions five times between 1981 and 2000, in addition were three runners up slots. 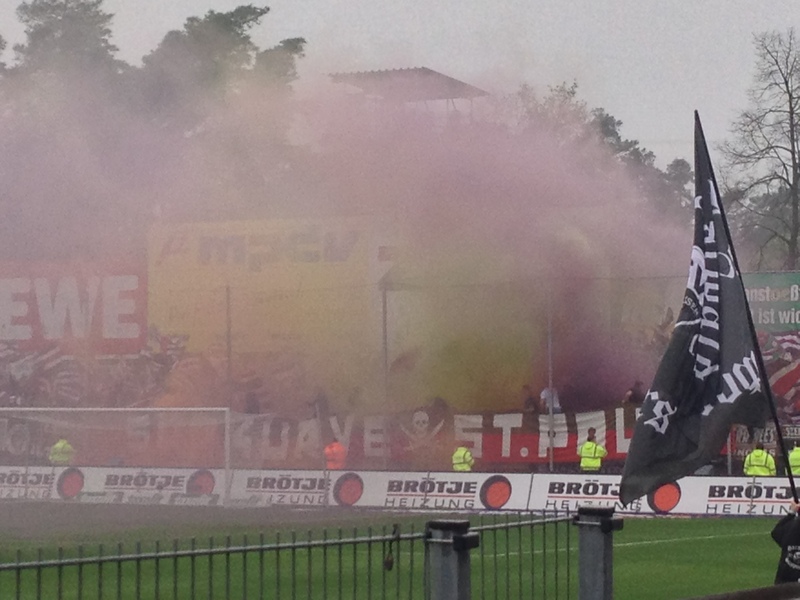 Promotion to the the then third tier Regionalliga Süd. 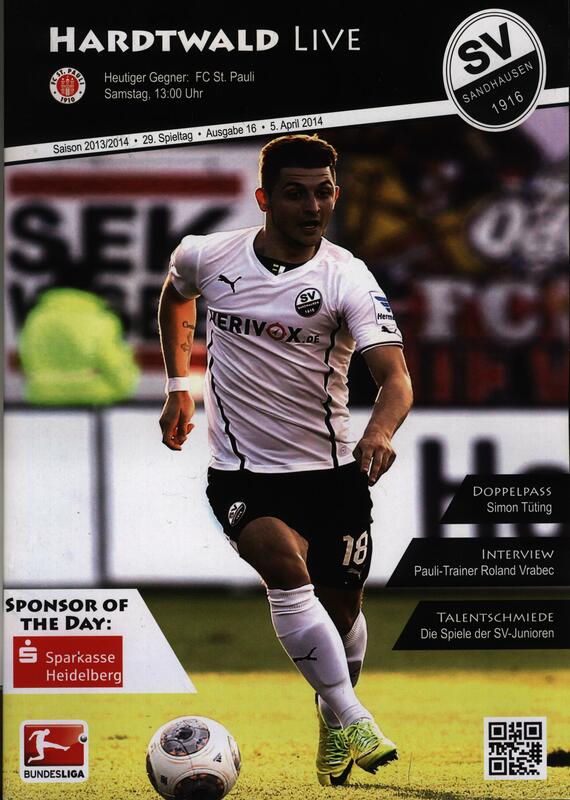 In 2011/12 Sandhausen won the Bundesliga 3 and with it promotion to their highest ever playing level. Needless to say the club’s rapid elevation in playing status has seen their once modest home of the Hardtwaldstadion substantially modernised. 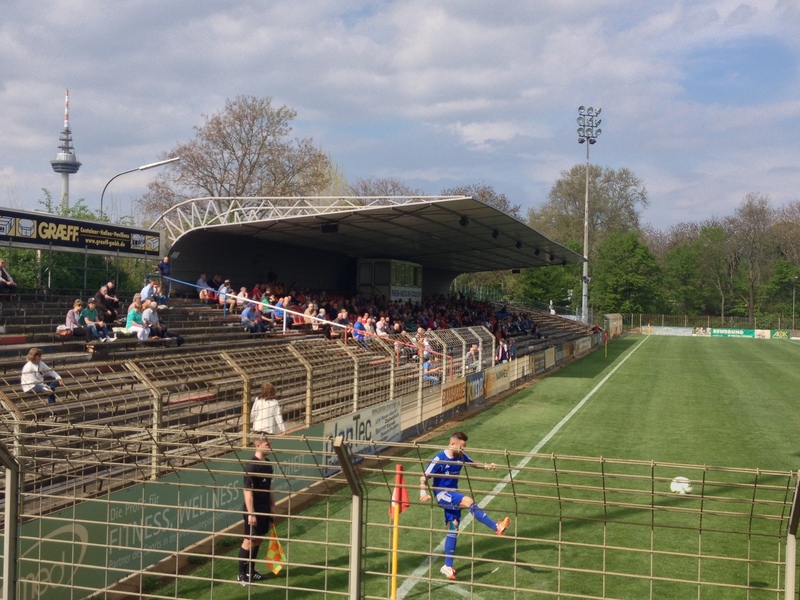 Home to SV Sandhausen since 1951 the ground initially had a clay surface and remarkably it was some ten years before turf was laid at the venue. 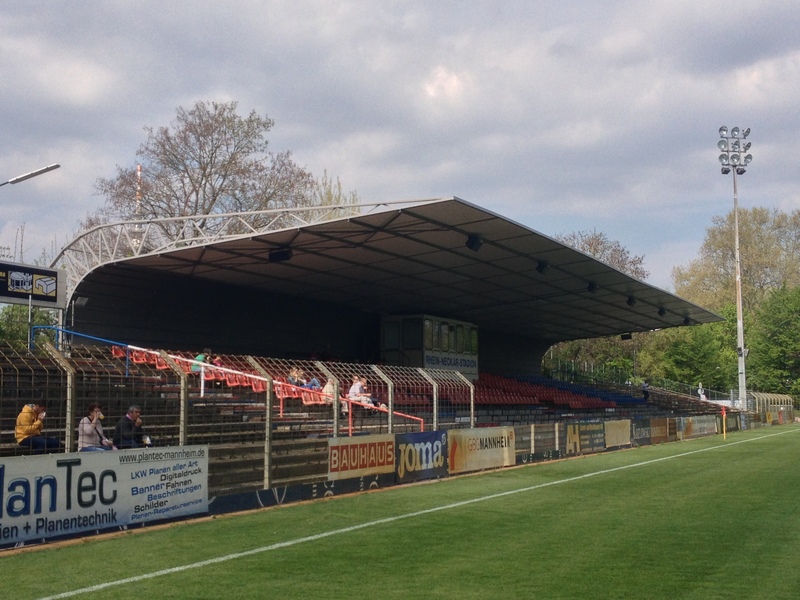 The current elevated main stand was built in 1987 and affords fine views of the pitch and the surrounding forest. 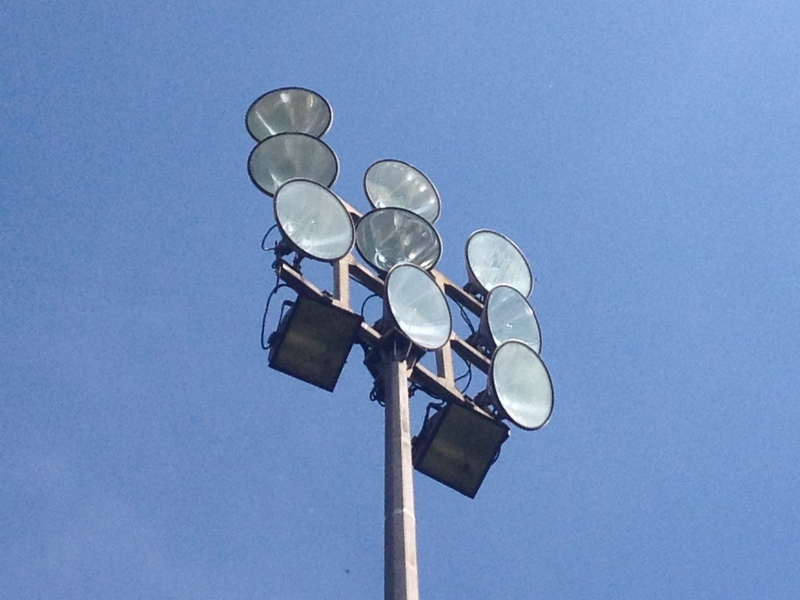 Floodlights came to the Hardtwaldstadion as recently as 2001 and in the last couple of years two new stands have been erected replacing temporary bleacher style seating to either side of the existing main stand. 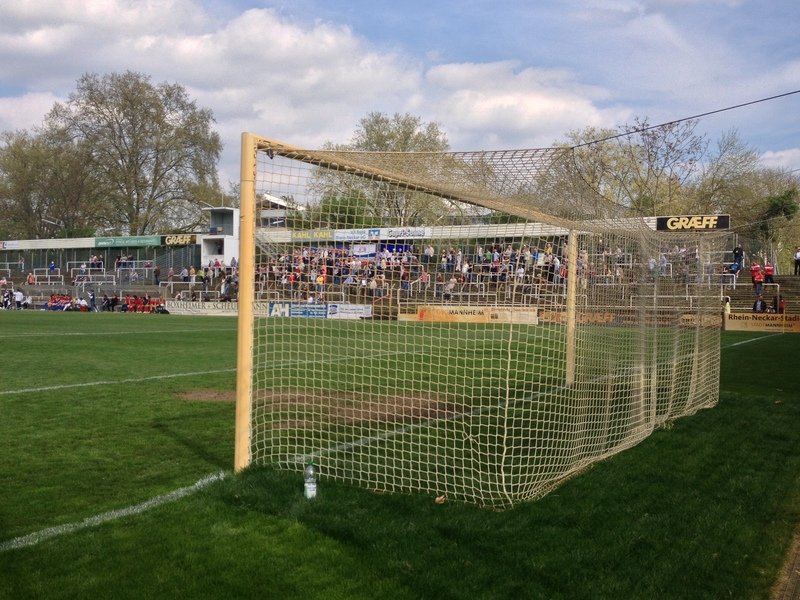 There is a large temporary seated stand behind one goal and uncovered terracing down one side and the far end. All in all the improvements now give the venue an impressive capacity of 12,100 and it now also boasts undersoil heating. 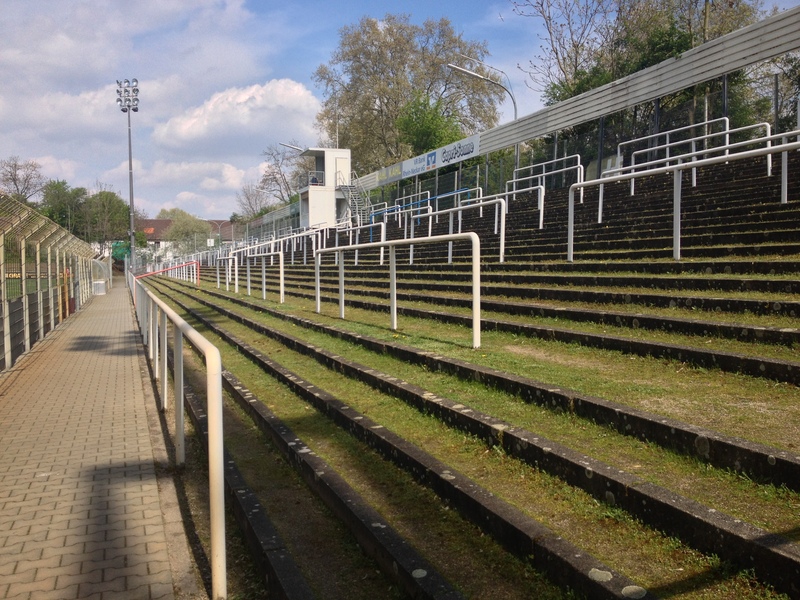 As the club look to consolidate in 2 Bundesliga there is even talk of a third new stand to be built at the western end of the ground with a further 3,000 seats. 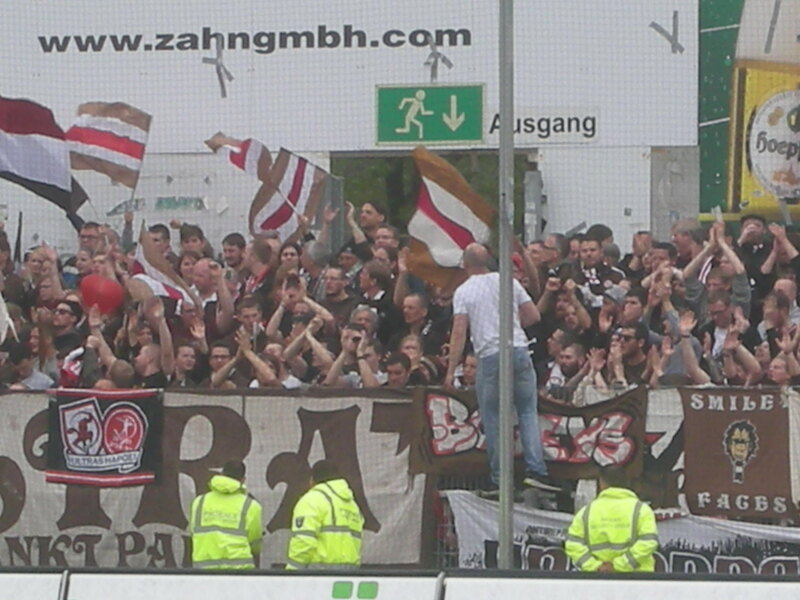 Today’s game sees visitors St.Pauli impressively fill the uncovered terracing and the end sector of the temporary stand. They are the boisterous flag waving collective of diaspora you would have expected them to be. Their support is bludgeoning and unrelenting and they are superb at what they do. 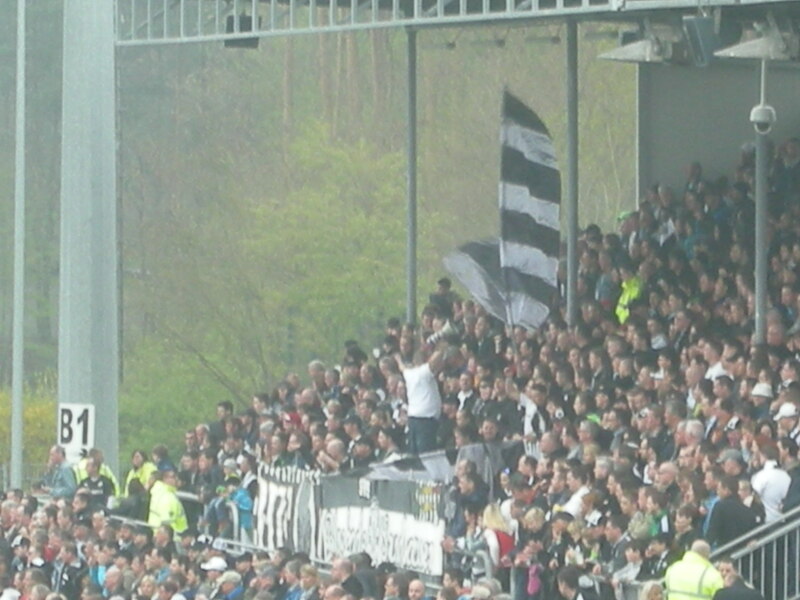 Sandhausen have their own “ultras”, comparatively sedate, housed in one of the new permanent stands. The first half was instantly forgettable being both low on technique and any semblance of drama. Thankfully the first half gave way to a robust and combative second period. 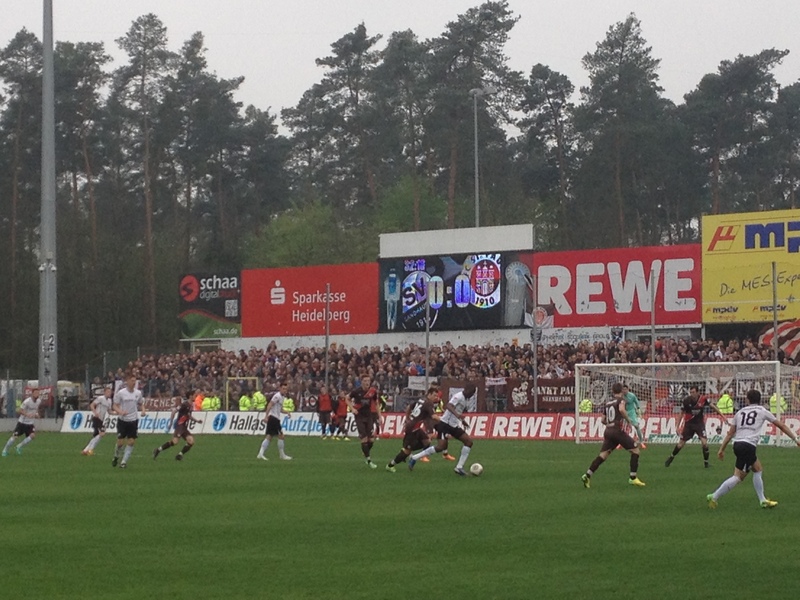 The hosts found themselves 2-1 up thanks to some calamitous St. Pauli defending. However that “cultest” of cult clubs gave us an epic comeback with goals from Schachten and Rzatkowski within two minutes of each other sealed an, at times, unlikely looking away victory. 33. Manuel Riemann, 5. Daniel Schulz, 6. Denis Linsmayer, 7. Marco Thiede, 18. Matthias Zimmermann, 21. Manuel Stiefler, 24. Simon Tüting (c); 25. Danny Blum, 27. Seyi Olajengbesi, 32. Timo Achenbach, 8. Nicky Adler. Subs: 1. Marco Knaller, 10. David Ulm (for 18,81 mins), 14. Tim Kister, 17. Florian Hübner (for 17,88 mins), 20. Eke Uzoma, 26. Radoslav Jovanovic (for 8,71 mins), 31. Stegan Kulovits. 13. Philipp Tschauner, 9. Christopher Nöthe, 10. Christopher Buchtmann, 11. Marc Rzatkowski, 12. John Verhoek, 14. Philipp Ziereis, 20. Sebastian Schachten, 23. Marcel Halstenberg, 26. Sören Gonther, 27. Jan-Philipp Kalla, 29. Sebastian Maier.